Kelley H. strongly believes in achieving excellence. That belief – and his commitment to it – paid off in a big way. The National Institute for Automotive Service Excellence (ASE) recently announced Kelley earned the prestigious Auto Care Association World Class Technician Award. Kelley, Customer Support Supervisor for Enterprise Fleet Management in St. Louis, qualified for the award by achieving the required certifications in 22 automotive service specialties. One of the reasons for its esteem: Less than 2,000 technicians have received the award over its 30-year history – and just 16 are receiving it in 2017. It wasn’t a quick journey, and it wasn’t always easy. 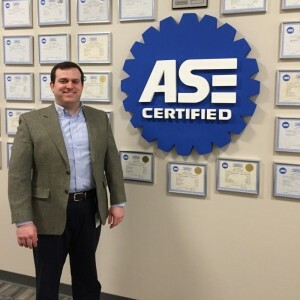 Kelley’s work to achieve ASE certifications spans his nearly 12-year Enterprise career. To become a World Class Technician, individuals must earn the titles of ASE Master Automobile Technician, ASE Master Medium/Heavy Duty Truck Technician and ASE Master Collision Repair Technician through certification tests in each area. Kelley’s discipline and consistency were keys to his success, as well as his desire to prioritize learning about topics that offered the most immediate benefits to him and his customers. While it takes 22 ASE tests to receive World Class Technician, Kelly once again went above and beyond the call of duty. To date, he has earned 32 certifications – in addition to his four Master Technician titles. Kelley’s commitment to automotive excellence began by accident, he says. While studying to become an architect in college, he worked in an automotive parts store. Noticing this might lead to a career, he volunteered to learn about collision repair and paint refinishing. That led to jobs in parts and service at high-volume Ford dealerships in St. Louis. As part of the Customer Support Team with Fleet Management, Kelley and his team are subject matter experts who provide assistance and training to the field, advanced technical repair support, and establish maintenance guidelines, among various other tasks. “It’s exciting, and there’s no place I’d rather be,” he says. True to his quest for excellence, Kelley is not slowing down. One of his goals is to earn a newly-offered advanced ASE certification in hybrid/electric vehicles. “Electric vehicles are the future, and I want to be among the first to earn certification in this emerging technology,” he says.